This was a wedding gift from my family, and has been very useful. 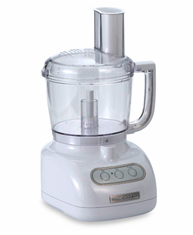 It has a large capacity, and is often a better choice than a blender. It is good at grinding up chicken for chicken salad, for grinding up nuts, etc. Very helpful. Yes, even though I love my KitchenAid mixer, I still like these mixing bowls (given to me by my friends the Turners for our wedding). I use them almost every time I make a meal–even if things don’t need to be mixed, it is a good way to store and separate ingredients. Of course, you don’t need this exact set (it’s just the one I have)…I just think that the various sizes are helpful. 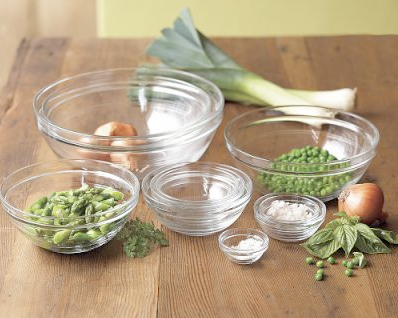 So, pretty much everyone already has measuring cups and spoons…so why bother recommending these? Well, there is one particular feature I think is neat about these (the cups, specifically): Within each cup, there are marks on the inside indicating other cup sizes. That is, in the “1 cup” cup, there are markings on the inside for 3/4 cup, 1/2 cup, and 1/4 cup. For the 1/2 cup there is a 1/4 cup mark on the inside, and for the 1/4 cup there is a 1/8 cup marking. 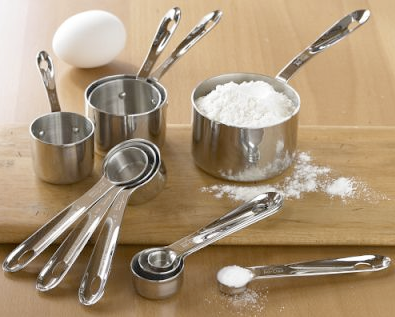 So basically, you could use just one measuring cup for an entire recipe that called for different amounts of a particular ingredient. And plus, stainless steel is always good. So thanks to the Hurts for getting us these! 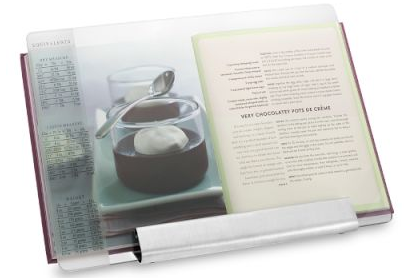 So, not only does this hold open cookbooks (believe me, over the years I have discovered this is a very helpful thing to have), but on the side it lists all sorts of cooking measurements/conversions (both US & Metric). This was also a wedding gift, from my mom’s cousin Rebecca. Thanks! This was given to us as a wedding gift from our Randolph friend, Sara Singhal. 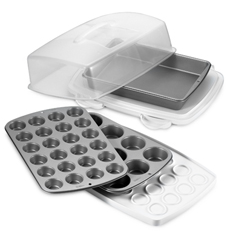 It includes a 12 cup muffin bake pan, 24 cup mini muffin bake pan, 13″ x 9″ bake pan, a 3-piece oblong caddy (to set your baked goods on for transport), and an extra deep cover and locking latches to keeps your desserts safe and secure during travel. 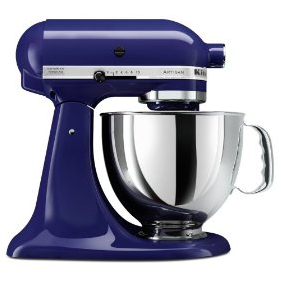 I have used it recently when making the aforementioned Hungry Girl Red Velvet Cupcakes for John and myself, and then for his Dungeons & Dragons group. 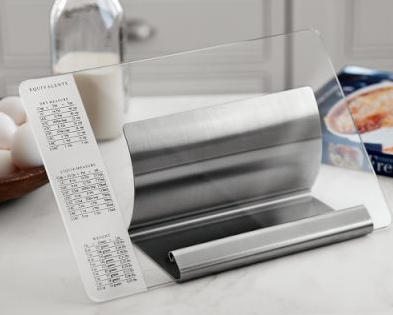 So, my mom has had a Pyrex version of this for awhile, and I always thought it was neat. Well, we got one as a wedding gift, and it has been great! 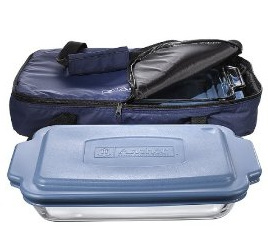 The set includes a 3 Quart Baker with a blue plastic lid for travel, a 2 Quart Baker with a blue plastic lid for travel, a convenient baker tote and a Hot/Cold pack to help keep your dishes hot/cold while traveling. I have already used it several times for potlucks/dinners with our Young Marrieds Bible Study. 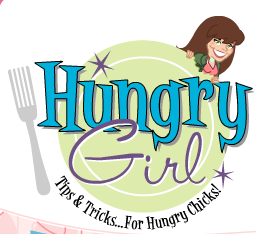 So, I mentioned in my last past that I have a Hungry Girl cookbook (link to her website listed with others links on left)…for those of you who don’t know, she has a fab website, great cookbooks, and a daily e-mail newsletter. They are chalked full of yummy recipes (desserts, entrees, etc…but all with lower calories/fat/sugar), dieting tips, new low cal snacks/products, info on restaurant’s offering some yummy but healthy dishes, and more. Even if you’re a guy, I would recommend going to her site at the least, signing up for her newsletter and/or getting one of her cookbooks. I mean really–she has recipes for cupcakes, cheesecake, chicken fingers, wings, nachos, fondue, etc, etc…all of which you can eat and not feel bad about it! Tonight I will be making her Too Good Twice Baked Potatoes with our meal. Will post more on that after dinner. 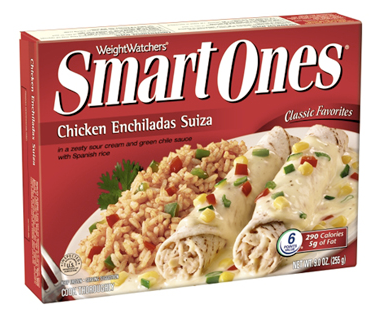 Finally, I would like to recommend Smart Ones’ Chicken Enchiladas Suiza. As far as diet frozen food goes, it was one of the better meals I had. I mean, it’s “served in a zesty sour cream and green chile sauce with Spanish rice”! 😉 Really, it was tasty, and only 6 weight watcher’s points. For full nutrition, go the link I just mentioned (it has a nutrition label on the page).